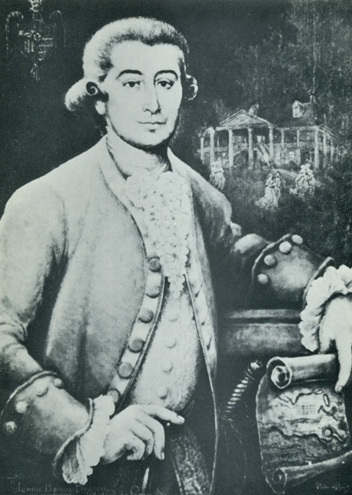 One of the most interesting and intriguing figures in early America was Manuel Gayoso de Lemos, the Spanish governor of the Natchez district during the time period covered in our book, The Fairest Portion of the Globe. Gayoso was not only a shrewd and able public administrator—which makes him stand out in any era—but a figure of larger-than-life proportions, with a life full of romance, adventure, and tragedy. Manuel Luis Gayoso de Lemos y Amorín was born on May 30, 1747, at Oporto, a charming coastal town in Portugal known for its world famous wine. His father was a Spanish consul in the Portuguese port and his mother was a native of Oporto. Gayoso may have been educated at Westminster College in England; he was said to have the accent and manners of the British. On July 7, 1771, he entered the Spanish army as a cadet in the Lisbon Regiment. Gayoso was handsome, good with languages, and naturally friendly and diplomatic. He rose quickly in the ranks, earning promotion to sub-lieutenant in 1772, sub-lieutenant of grenadiers in 1779, and lieutenant in 1781. For more than a year in 1781 and 1782, Gayoso served on the Spanish warship La España. 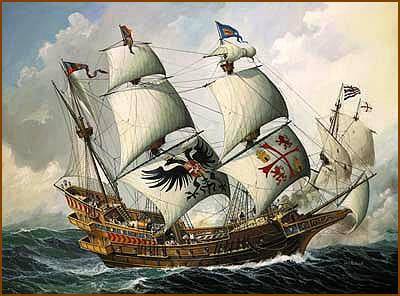 The ship boasted 64 cannons and cruised around the Iberian peninsula, looking out for British warships (Spain had entered the Revolution on the side of France, and against England). During the Siege of Gibraltar, Gayoso had a chance to see some of the Spanish commanders in action. Spain and France were defeated by the superior British navy, but with impeccable timing, Gayoso secured another diplomatic assignment. Gayoso’s excellent performance as a diplomatic assistant gained him promotion to lieutenant colonel in 1786. During this time, he met and wooed a beautiful Lisbon belle, Theresa Margarita Hopman y Pereira. Theresa was planning their wedding when he received the unexpected news that he was being considered for an assignment in America—namely, governor of the Natchez District, a huge extent of territory in West Florida that stretched from Point Coupee in the south to the mouth of the Yazoo River in the north, with the Mississippi River forming its western border. It was a sparsely populated, heavily disputed territory that had already been the focus of a considerable amount of intrigue since Spain had won it from the British during the Revolution. It also had lots of bears, and the temperature got up to 107 in the summer. Who could refuse? Gayoso married Theresa in 1787 and was delayed setting off by the birth of their first child, Manuel Gayoso Hopman, in 1788. Accompanied by his wife and two servants, the new governor finally set out in September 1788. They reached Havana in December and remained there for several weeks. In February 1789, Gayoso left Havana with his wife, small son and new infant daughter, on their way to New Orleans. A violent storm blew the ship off course, and for nine days they were in danger of sinking. They put in at the Yucatan and lingered there for a month before they eventually got another ship and arrived in New Orleans in April 1789, where Gayoso met with his new boss, Governor General Esteban Miró of Louisiana, and got briefed on his duties in Natchez. Tragically, the trip had been too much for Theresa Gayoso. Weak from her recent childbirth and seized with fever, she died shortly after they got to Natchez. One of Gayoso’s first duties was to bury her there. Their infant daughter, likewise, did not survive long in the New World. Gayoso sought to lower the high rate of homicide in his frontier district by banning knives and pistols, but outlaws with a penchant for stabbing circumvented the law by fashioning effective stilettos of hardened wood. As governor, Gayoso was the chief magistrate and possessed the power to adjudicate disputes and arrange settlements. In Natchez Saturday was court day, and Gayoso spent virtually the entire day hearing complaints of various types and rendering his decisions. He was as tough on miscreants as his authority allowed, petitioning Miró unsuccessfully for the funds to build a jail. Gayoso had considerable power over the church in his district. Because the governors were considered the Spanish King’s representatives the new world, they had the power to create new bishoprics, dioceses, parishes, and other church posts. Gayoso was tolerant of various religious sects in Natchez, but he didn’t take any guff off the priests and didn’t hesitate to let them know who was boss. Miró left the governorship of Louisiana in 1791 and returned to Spain. 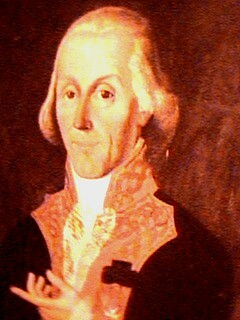 Gayoso had hoped to replace him, but was disappointed when Francisco Luis Hector de Carondelet was appointed in his place. Despite initial reason for tension, the two men seemed to have had an effective working relationship. When Carondelet arrived in 1791, he was appalled at the state of Spain’s defenses on the lower Mississippi. Together, Gayoso and Carondelet set about a long-term program to beef up Spain’s military defenses. At Gayoso’s urging, Carondelet created the Squadron of the Mississippi, which came to include six galleys, four galiots, one bombardier, and six cannon launches. 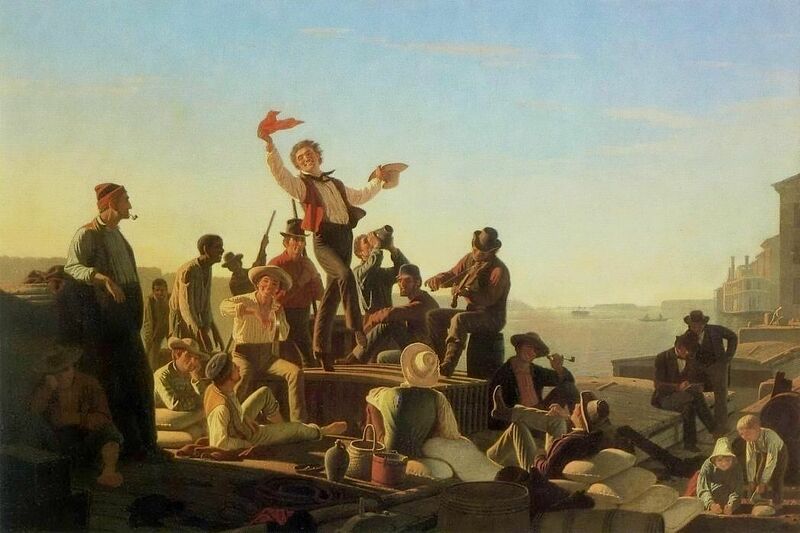 In 1795, the crew members numbered over 300. The larger galleys boasted an 18-pounder cannon and eight to ten swivel guns. They were used for reconnaissance expeditions up and down the Mississippi. Gayoso also recommended to Carondelet construction of additional forts in the Mississippi Valley. They beefed up defenses in Nogales, Natchez, New Orleans, and Baton Rouge. Gayoso beat the Americans to Chickasaw Bluffs through painstaking negotiations with the Chickasaws, who finally consented to let Spain build a small military post there. Gayoso was supported by a majority of the ships in the Spanish squadron when he established a new military post at Chickasaw Bluffs in 1795. The new fortifications aside, Gayoso believed that the primary defense of Louisiana lay not in expensive permanent forts, but in the willingness of Natchez settlers to defend their homes and plantations. Louisiana had a regular battalion of infantry—at least on paper (in fact, the battalion was never at full strength despite recruiting efforts in Mexico and emptying out all the jails in the Spanish empire). Gayoso persuaded Carondelet to organize a real militia, though Carondelet was mistrustful of the French settlers in Natchez and was reluctant to give them too much leeway. Gayoso persevered, and by the fall of 1793, he had organized two companies of infantry, two of cavalry, and one of artillery for Natchez. The very first sight of the house, seen through a long vista of noble trees, as you enter the gate, forms a splendid picture. About half way from the gate is a large pond surrounded by gnarled old cedars, after which the road branches into two, on each side of an extensive sloping lawn, and the end of the delightful drive brings us to the house itself. Built of brick with walls fully two feet thick, there is an air of massiveness and solidity about this grand old house that gives promise of centuries of useful existence before it shall succumb to the leveling hand of time. On the ground floor a broad gallery paved with brick completely circles the house, and lofty pillars reaching to the roof support another broad gallery upon which all the second story rooms open. These pillars are about four feet in diameter, made of brick covered with mortar, which gives them the appearance of stone. Two winding flights of stairs, one on each side of the entrance, made of the purest white marble, lead from the ground to the upper gallery, where they meet in a solid slab of snow white marble about six feet wide and ten feet long … A vestibule paved with alternate squares of black and white marble, after the houses of Pompeii, leads through the richly carved front door into a broad hall extending the full length of the house. 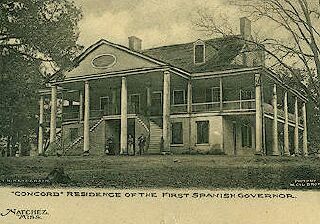 Gayoso's home, Concord, in Natchez. This beautiful mansion burned in 1901. To his beautiful home, Gayoso brought his second wife, an American beauty named Elizabeth Watts, in April 1792. Unfortunately, Elizabeth contracted a fever and died within three months of their marriage. A curious legend sprang up that the grief-stricken governor kept his dead wife in a tub filled with embalming fluid on the second story of Concord. Several years passed before Gayoso began courting the younger sister of his second wife, Margaret Cyrilla Watts. However, the road to matrimony was far from smooth. When Gayoso sailed north to New Madrid in 1795 (where he happened to run into young William Clark), ugly rumors circulated to the effect that he was keeping a mistress there, had built a house for her, and intended to marry her. Governor Carondelet heard the rumors and was disturbed enough to write to Gayoso, reminding him that it was common knowledge that he had “lived as a husband” to Margaret Watts in Natchez and that if he didn’t behave himself, he was going to get in trouble with the Bishop of New Orleans. Gayoso finally requested a royal license to marry Margaret in early 1796. Carondelet forwarded the paperwork through the captain-general of Cuba to the secretary of war. Official permission was not forthcoming until March 1797, by which time Margaret was noticeably pregnant. Concerned about their status, Gayoso asked Carondelet to grant interim permission, which he declined to do. On July 14, 1797, Margaret gave birth to a healthy son, whom they named Fernando. 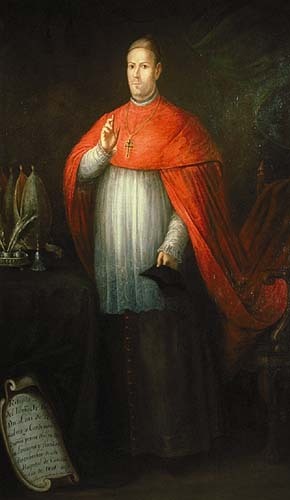 When the Gayosos went to New Orleans later that year, an interesting religious ceremony took place, in which the Bishop baptized young Fernando and married his parents. He was educated in Great Britain, and retained in a considerable degree the manners, and customs, of that nation until his death, especially in his style of living. In his conversation he was easy and affable, and his politeness was of that superior cast, which showed it to be the effect of early habit, rather than an accomplishment merely intended to render him agreeable. His passions were naturally so strong, and his temper so remarkably quick, that they sometimes hurried him into difficulties, from which he was not easily extricated. He was fond of show and parade, which he indulged to the great injury of his fortune, and not a little to his reputation as a paymaster. This fondness for parade showed itself in all his transactions, but in nothing more than the ordinary business of his government, to which, method and system, were too generally sacrificed. In his domestic character, he merited imitation: he was a tender husband, an affectionate parent, and a good master. Dear Frances. I received yesterday The fairest portion of the globe. Merci beaucoup. I am reading the chapters about Michaux, his son and Genet. C’est passionnant. The sentencies “en français dans le texte” are funny. The love between André and Fanny is a very good idea. André Michaux was really an hero and frontiersman. He didn’t expelled from USA, after the Genet Affair, but he remaind without difficulties three years in USA and made several journeys. He made a secund journey in 1795-1796 to Kentucky and along the Mississippi. Don Gayoso received him 16th December 1795. André Michaux died exactly 11th october 1802 at Tamatave (now Toamasina, Madagascar). Régis Pluchet, great-great-great nephew of André Michaux, correspondent of André Michaux International Society (www.michaux.org). Régis, so glad you are enjoying the book. As you can see, we took a little artistic license with the timeline to make a better story. Michaux is all too often remembered only for the Citizen Genet Affair when he should be remembered as one of the great naturalists of early America. 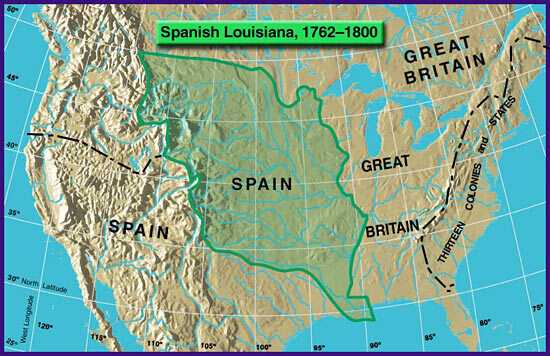 The map of Spanish Louisiana is often used and published, but is wrong. The Spanish had influence in, and claimed Wisconsin and Michigan. They occupied Fort St. Joseph in michigan from 1781-1795, and claimed the lands east of the Missisipi for the Spanish. They had active alliances with the native populations throughout Wisconsin and Michigan. Hi Frances, Do you mind if I borrow from your post for my story of Stephen Minor – The Last Spanish Governor of Natchez? Traitor extraordinaire James Wilkinson should be better known. I’m pretty well versed in American history and today is the first I’ve heard of him. Mark, your page is amazing! You are more than welcome to borrow from our post. I think your conclusions are correct about Minor’s involvement with Gayoso. Minor was one of those characters who was on whichever “side” was on the ascendancy at any given time, and on the Natchez frontier that line was ever-shifting for decades! Piecing together what happened during the times of the Spanish Conspiracy is very, very difficult and complicated. No book on the subject exists. We relied on Gayoso: The Life of a Spanish Governor in the Mississippi Valley, 1789-1799, by Jack D. Holmes (1965), Tarnished Warrior, by James Ripley Jacobs (1938) (a biography of Wilkinson), and “The Intrigues of Dr. James O’Fallon,” by John Carl Parish, published in the Mississippi Valley Historical Review in 1930. Since “Fairest” came out, there is a new biography of Wilkinson by Andro Linklater called An Artist in Treason (2009). Wilkinson is a complex and troubling figure and I believe that is why many historians and biographers try not to have to deal with him. Once you are aware of his presence in early America, you will start to find that he pops up everywhere and in the most surprising places. The actual Lemos conspiracy was simple: To encourage secular republics throughout America ( then worldwide) , then mostly ruled by Gil-Lemos cousins such as Gayoso, Taboada and Galvez de los de Lemos. Just look at a map of the time. The Lemos were always associated as guardians with the liberal republics and libertarian communities of Spain and the Mediterranean. They’re pretty open about it. The leader is not only an image of IMHO Gayoso, but has that Lemos affability and charm. Wow – I am reading about my great great great grandfather Don Manual Gayoso De Lomas. If I understand correctly, his son was Fernando then there was Ferdinand then there was Cicero who was my mother’s father. My mother is Lorene Gayoso Wilder. She is 94 & the last living of Cicero’s 13 children. In past years the Natchez historical society has taken great interest in the Gayoso siblings who traveled to Natchez to learn of their Great great grandfathers governorship. Even today she has a beautiful painting of the Concordia.